Cricket is outrageous. Andrew Flintoff once described it to Jennifer Lopez as a sport that lasts five days where players spend a lot of time “rubbing their balls on their trousers”. And if test cricket is outrageous that way, T20 is even more so in its own designs. So outrageous that a team can go from world number eight to number one after winning three back to back games. Fast, short, sweet and often bitter, T20 is much like Twitter. You haven’t got much time or space to show what you’ve got, but you still try to make the best of it. India’s weeks Down Under have often been an exhibit of the young and the old from both sides trying to answer the door as fast as they can when opportunity knocks. Some were successful, some Shaun Tait. Fascinating things happened once the rubber died, both in the ODIs and the T20Is. In the third and final T20I at the SCG, when India had already sealed the series, two people took it upon themselves to prove a point; that they were not done. Suresh Raina, probably one of the more likable and familiar faces in the Indian team for the past decade, was dropped from the ODI squad ahead of the tour. A man, who had been a reliable finisher and big hitter in the Indian middle and lower-middle order, apart from being a handy part-time spinner and a really handy fielder, had scores of 12, 53, 0, 0 and 3 in his last five ODIs in the home series against South Africa. Instead, a few young buds were given a chance to blossom. The middle order responsibilities that go beyond MS Dhoni were put on the rookie shoulders of Gurkeerat Singh Mann and Rishi Dhawan, with mixed results. Many said Raina’s exclusion was harsh, and some said it would hurt India’s batting. One thing is certain, being dropped did hurt Raina. And India’s middle order did miss him in the ODI series. Barring the final game, India always found itself a few runs short, often faltering in the death overs. It was always close. The T20I series was his chance to prove that he was not yet dispensable. Unlike Yuvraj Singh, another man out to prove a point, Raina got a chance to wield a bat in the first T20I itself. It was cautious 41 where Raina played sidekick to Virat Kohli’s superhero. But he played it ably. T20 cricket is Raina’s forte. A good finisher, clean hitter of the ball, who provides an off-break option and is mighty fine in the field, the all-rounder fits the format like spandex. And Raina came into the series confident; his 47 off 37 had helped Uttar Pradesh lay claim on the maiden Syed Mushtaq Ali T20 Tournament. But on Sunday, Raina needed to be more than a sidekick. Chasing a mammoth 198, he walked in at 124/2 when Rohit Sharma departed after providing India yet another solid foundation. Fourteen balls later Kohli, the man with the golden bat, walked too. It was then up to Raina and Yuvraj, batting for the first time in the series, to see India through. With 50 runs required off the last five overs, Raina hit six fours and a maximum on his way to 49 off 25 balls. Yuvraj played a cameo left for late, Raina hit a four off the last ball to complete a series whitewash over Australia — a first in their own backyard. With his showing in the T20 series, Raina proved his utility in ODIs where India were left wanting for more. And make no mistake, he will be back in the ODI squad. Because India needs Suresh Raina. For now, as T20s are paving the way leading up to World Cup of the shortest format, India looks to be settling down with its combination. Experience can’t be bargained with. And Dhoni has taken a few pointers from the tour. The limited overs captain said after the Sydney T2OI that this squad would largely be the same for the World T20. He seemed to have understood that be it T20 or ODI, it can’t be just him standing between India’s excellent top-order and unreliable tail. 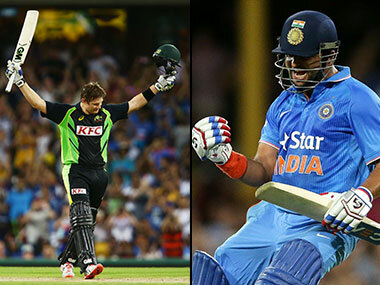 If Raina came through for India, making a statement in the process, it was Shane Watson who did the same for the hosts. Not many though 34-year-old Watson would be ready for this. Australia are a ruthless team, and they care not for sentiment. If you’re doing well, you’re in. if you’re not, move over. Watson had to move over in the later half of 2015. He had already retired from Tests. He played his last ODI against England at Lord’s in September before being dropped. He had featured in just a single T20I in 2015. Even he thought he was done. “After being dropped from the one-day squad I knew my international days were probably over, so it’s nice to get that surprise,” he had said after being recalled for the T20I series against India. Watson was wrong. After glimpses of utility, mostly with the ball, in the first two games, Watson was handed captaincy for the third one in absence of injured Aaron Finch. This time, people got more than just a glimpse of what he can still do with a bat. He won the toss, opened the batting and lasted the entire 20 overs. By the end of it, Watson had become the only Australian to hit a century in all three formats of the game. His brilliant 124 off 71, the second highest T20I individual score that included 10 fours and six sixes, carried Australia to 197 almost single-handedly. A decade into his T20I career, Watson played his best knock. And he impressed with the ball once again, dismissing Shikhar Dhawan and putting a restriction on the free-flowing runs. In the end Raina’s efforts trumped Watson’s, but both were left redeemed. With a few good BBL knocks for Sydney Thunder and now a T20I ton to his name, Watson has all but ensured his name on the Aussie team-sheet for the World T20. He knows the Indian soil well through IPL exploits and his experience would be vital in a new-look Australia side. An ODI comeback looks unlikely. But hey, it’s cricket. Stranger things have happened. He’s doing well, he could get in. No sentiment involved in that. The scorecards will say Shane Watson scored a ton in vain at the SCG. But we all know, and so does Watson, that he didn’t.